Painting Acrylic and Oil on Canvas | 32" x 40"
Painting Mixed Media on Canvas | 67" x 92"
A vivacious and governed amalgamation of shapes and forms are fundamental to my art. In addition, I generally use a wide range of colour schemes which is another important aspect of my artistry. These shapes, forms and colours blend in together on the canvas to form a painting that is abstract and quirky. However, the abstract theme appears just on the surface of my paintings. If you look deeper into my work, you will perhaps be able to understand the hidden message. Just like a significant meaning emerges out of this topsy-turvy universe, my paintings work in a similar fashion. And so, I can say my work of art is a mirror image of the universe. 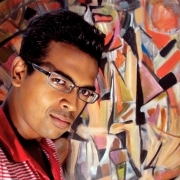 Sumeet Chaudhary’s passion for creative arts was developing while he was still in school. After completing school, he decided to take his passion seriously and thus decided to not take up any further education. He did not even receive any formal education for arts because he strongly believed that any education in this field will obstruct his ingenuity of art and so, he is a self taught artist. His style of painting is idiosyncratic which includes a controlled yet messy pattern of shapes and forms.